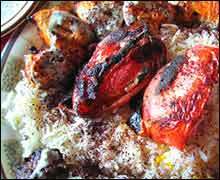 Persian Food Festival is an event that took place between 16-Feb-2007 and 25-Feb-2007 in Hyderabad. Does Mehregan ring a bell? Does Persia ring a bell? Okay, does good food ring a bell? Yes, that was really the only question. On the occasion of Mehregan, a community autumn festival of Persia (now Iran), The Jewel of Nizam restaurant at Hotel Golconda is organising a Persian Food Festival from 16th to 25th February. Mehregan is an annual event that celebrates Persian culture with music, dance, artwork, crafts, traditional Persian cuisine, traditional tea house and costumes. It is a celebration in honor of the ancient Persian Goddess Mehr, the spirit of love, knowledge and commitment. With Irani chai and Irani haleem indelibly part of Hyderabadi cuisine, Persia has become a part of our lives. Cashing on this, Hotel Golconda has created a décor and ambience that reflects the essence of the royal Nizami era of the days gone by, at its Hyderabadi speciality restaurant The Jewel of Nizam. The restaurant is aesthetically designed with murals of the Nizam, and the artefacts in the restaurant reflect a really memorable era gone by. These are complemented with cozy and contemporary seating, and ethnic musicians from the magical land will play their instruments during the festival. The musicians will be supplemented by recorded music from the land of Persia. Long-flowing embroidered sherwanis with tight-fitting pajamas and a royal guard with a pointed turban will add to the atmosphere. The delicacies are available for both lunch and dinner on all the days - a la carte for lunch, and a buffet for dinner which costs Rs. 500 per head. For further details, please contact the restaurant at 6611-0101/2332-0202. Be the first to comment on Persian Food Festival! Just use the simple form below. fullhyd.com has 700,000+ monthly visits. Tell Hyderabad what you feel about Persian Food Festival!